Join the Nordic Division for our special conference events. We hope to see you in Washington D.C.! No registration needed – Meet us at the Nordic Division table at the welcome reception if you would like to join us; or meet us at the bar venue! This year’s ND Dinner will take place at award-winning Spanish restaurant La Taberna del Alabardero. We will start off with tapas and sangria, followed by different paellas; all served family style. A few different tapas will be served, to cater to all tastes. A dessert of your choice will also be included. 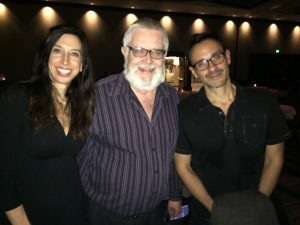 Alisa Hamilton with Erling Dugan (middle) and Carlos Umaña (right).